What is the big deal about President Obama's speech to the National Prayer Breakfast? After all, there's no secret that some people have used Christianity to further their misguided or horrific goals in the past. Possibly the worst and most polluted human life form with a brainstem that has ever lived, Adolf Hitler, tugged at the strands of the diminishing thoughts and writings of a declining Martin Luther who became increasingly more anti-semitic as he aged, to justify what came to be known as 'The Final Solution' as he and his henchmen exterminated at least 6 million Jews during World War II and possibly millions more. Mentally and morally sick and corrupt people will grasp at any ethical or religious straw they can to justify their abuse of power. It is somehow embedded in human nature to do so. Which is precisely what the Islamist terrorists are doing today in the name of the Prophet Muhammad and Islam. If the President can say that certain Christians have used Christianity to justify slavery and Jim Crow laws in the South, why can't he also say that certain Muslims have used Islam to justify jihad and kill infidels such as Americans wherever they can? What is so difficult about that? This President seems to be ever-willing to blame America first, Christianity first, capitalism first for all the national and global ills but he is simply unwilling to cast blame on other nations, other religions or other government systems the world over for much of anything. It is like President Obama sees himself as 'The Great Apologizer' for past American sins or something. Here's the official transcript of the President's speech as put out by the White House immediately when he began talking at 9:13 am on February 5, 2015. Read it for yourself and see what you think. Based on the fact that this was issued at 9:13 am makes you have to believe that his comments about the Crusades and Jim Crow were not ad-libbed or a deviation from the written text but rather a fully-thought-out-in-advance-and-vetted-with-staff-and-speechwriters-beforehand planned statement. For the most part of the speech, there seems to be no controversy or unusual language in it. Just another of the usual run-of-the-mill political speeches at a religious event which is not as easy as it sounds to pull off unless you have seen it up-close-and-personal. 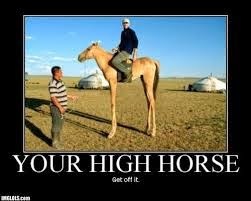 'Lest we get on our high horse?' What sort of language is that for the Leader of the Free World to use at a religious meeting of any source? Talk about bad timing. Talk about an unforced error. 48 hours after witnessing the horrific immolation of the captured Syrian pilot who was locked in a cage like an animal before being doused by gasoline and set aflame, President Obama and his team somehow inexplicably chose to compare Christianity to these radical ISIS terrorists right when everyone still had that horrific image in their heads. We can not see Winston Churchill in Parliament comparing the atrocities of Hitler to the Anglican Church of 1939 or even the Crusades. We can't see FDR on December 8, 1941 comparing the Japanese terrorists who bombed Pearl Harbor the day before to the institution of slavery in antebellum South. There was no equivocation faced with the dangers of severely demented and dangerous political and military leaders in Germany and Japan. These ISIS killers are clearly cut out of the same bolt of poisoned cloth as were Hitler and the Japanese Imperialists from Hirohito on down through the military leadership. Almost immediately upon the conclusion of the speech, we were contacted by a person we highly respect who was steaming about the speech as he was driving down the road somewhere. He has the added benefit of having served our country in the Afghanistan war theater for many years and has an acute understanding of the political situation over there, especially among the Muslim nations and factions we are facing. The President of the United States should not be giving our opponents and people who want to kill Americans any sort of support by comparing us to the Crusades since they already believe the US is part of the history against Islam from the Crusades which essentially ended in the 13th century. It's no coincidence that the Taliban and other Islamic extremists regularly refer to the United States and its coalition partners as "crusaders." By invoking the Crusades of history, the Taliban and other such groups create a "thematic frame" to lure recruits and others by recalling supposed horrors against Muslims. By also pointing back to the Crusades, the President of the United States utilizes the same thematic frame, which only serves to amplify extremist messaging. We could go on all day about this but suffice it to say that we are looking forward to the day when we have a US President once again who can see the good in America despite the warts and moles and cancers we have had in our past. One thing the President could have said at the National Prayer Breakfast about Christians in America is that they were the driving force behind the abolition of slavery in perhaps the first eradication of slavery in recorded human history. The Transcendentalist movement in the Northern churches produced the abolitionists who pushed for the end to slavery almost from the beginning of our Republic. William Wilberforce in England pushed relentlessly for the end to the slave trade in Britain almost solely because of his devout Christian faith. America and Britain and other western cultures may not be perfect. Certainly there are, and have been, inequities in capitalism, the Christian Church and democratic republics in history. Maybe the same can be said for Christianity in the religious belief world as well. It is our job to constantly try to make things better whether through our political views or our religious beliefs or just because it the right thing to do. It would help to have a President share in the basic inherent goodness of democracy and Christian belief to help lead us and the world towards that better tomorrow. In the past week, this issue needed serious attention, such as this excellent work by Telemachus. Instead, our headlines and news analysis has all been about a television anchorman (who so often portrays himself in TV sitcoms that it is difficult to keep track of the real over fiction Brian Williams) and a transgender former Olympic athlete whose wreck in California caused news alerts to ping and more ad nauseam commentary about the Kardashians, whoever they are. This in a week when the President of the United States used a "prayer breakfast" not to unite or console, but to divide and chastise on the continuing frightening acts of Islamists. Just 48 hours after we watched a man burned a live in a cage, the President sought the stage not to calm us, and to give us hope, but to sting us with rebuke that we ought not be on a "high horse." And he did so with the exact frame of reference as the extremists: to harken back to 1,000 years ago when less evolved men ate raw meat with their hands and let the blood drip down the sides of their mouths. Our whole approach in countering violent extremism is to gently urge at-risk youth to come into a modern age and not rely on such historical contexts. Now, our president has conveniently reminded them of those atrocities committed long ago (by not only Christians, Barak, but Muslims too). Then he further amplifies extremists views of America by invoking "slavery" and "Jim Crow." The yawn on Capitol Hill to the speech demonstrates how our collective mindset is far removed from what it is going to take to defeat a very real enemy. At least what we should do is not adopt the same language and thematic frame as the enemy, and that is exactly what the president did last week. Thanks for your edifying comments here, Mr. Snepp.